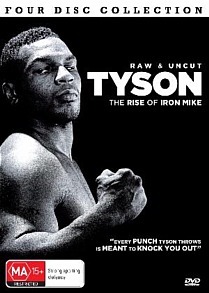 Tyson - The Rise of Iron Mike (Raw & Uncut) DVD Review Tyson’s propensity for self-destruction, his downward professional and personal trajectory after leaving longtime trainer Kevin Rooney, his arrests and later psychopathic outbursts both in and out of the ring - that all came later. These early fights are an excellent reminder of what Tyson once was, and what he could have been. The early career of Mike Tyson continues to divide critics and fight fans. Was Iron Man really the fearsome, near-unbeatable warrior painted by his management’s propaganda, or was his propensity for early knockouts more a reflection of the calibre of his opponents, middle of the road journeymen hand-picked to make him look good? Whatever the answer many of his early bouts are still singularly entertaining to watch, and Tyson’s focus inside the ring and his ability to dispatch fighters with an incredible combination of power and speed still make for compelling viewing a quarter of a century after the fact. Collected here are 24 of Tyson’s first 25 fights. His sixth professional bout against a forgotten soup can named Larry Sims is missing, as it is from all Tyson collections. Some say it was never recorded, some say the footage was lost, but there’s also speculation the Tyson camp ordered the footage destroyed after Tyson took several rounds to dispatch a third-rate fighter he was supposed to put down in the first. Whatever the reason the fight has never surfaced, and the present collection is as comprehensive a summary of Tyson’s early career as has ever been offered. Many of these fights have been offered on previous collections such as Fight Night Volume II and all are obviously available on bootleg collections of Tyson’s entire career, but where the series really shines is in providing period pre- and post-fight interview footage, much of it quite rare, even for the diehards. Another big plus is good quality footage of Tyson’s 25th fight against Marvis Frazier, during which Iron Mike absolutely demolished the son of legend Joe Frazier well inside a minute. I’ve own five or six Tyson DVDs and a bootleg collection, and I’ve never seen a decent full length version of this bout, let alone the pre- and post- footage. It’s almost worth the price of admission alone. Tyson’s propensity for self-destruction, his downward professional and personal trajectory after leaving longtime trainer Kevin Rooney, his arrests and later psychopathic outbursts both in and out of the ring - that all came later. These early fights are an excellent reminder of what Tyson once was, and what he could have been. Picture quality is necessarily a little rough - most of these fights are over a quarter of a century old and many have presumably been transferred from VHS. Some appear to be multi-generational. But by the standards of other early collections the bulk are quite good, some appearing as fresh as they’ve ever looked, and significant effort seem to have been taken to source the best extant version of each fight. The standard 2-channel audio is perfectly fine, and actually surprisingly robust. The only bonus feature is the fairly random inclusion of Tyson’s 36th fight, against blustering, largely useless British bumbler Frank Bruno. Tyson had left Rooney and his former manager Jim Jacobs and joined the Don King camp by this point, to his eternal detriment, and his performance was hardly conclusive. Not one of the better Tyson fights, and there were several of the period that would have made for a better inclusion.